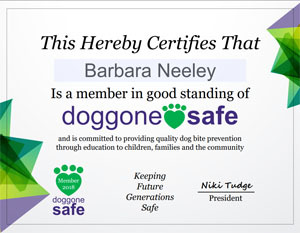 My name is Barbara Neeley and I am a graduate of Animal Behavior College where I earned my certification as an ABC Certified Dog Trainer. Animal Behavior College (ABC) is approved by the Bureau for Private Postsecondary and Vocational Education and is an internationally recognized school. My year long commitment to this program has provided me with a formal education in canine obedience training and understanding behavior and its motives. My certification, education and experience provide me the skills required to effectively and humanely train your dog while keeping alive the spark that makes your dog so special to you. Private Sessions tailored to your specific needs. Intermediate/AKC Canine Good Citizen Obedience Sessions and Evaluation. A Seminar on “Preparing Fido to Welcome the New Baby”. I 'm very family oriented, believing that every family member has a role in training a polite well mannered canine companion. My goal is to help you develop a mutual respectful relationship between all family members and your dog. My training philosophy is based on gentle positive reinforcement with no aversive methods such as choke chains, prong collars, shock collars or physical manipulation used. I'm willing to gear training towards families with young children, and stress the importance of how children can be safe around their dogs as well as unfamiliar dogs. Click "N' Paws Dog Training Located in North Ogden near Weber High School. I serve Ogden, Roy, South Ogden, Riverdale, Uintah, Washington Terrace, North Ogden, Pleasant View, Harrisville, Huntsville, Eden, Farr West, Plain City, West Haven, Hooper, Marriott-Slaterville in Weber County, Utah. Also Davis and Box Elder Counties.